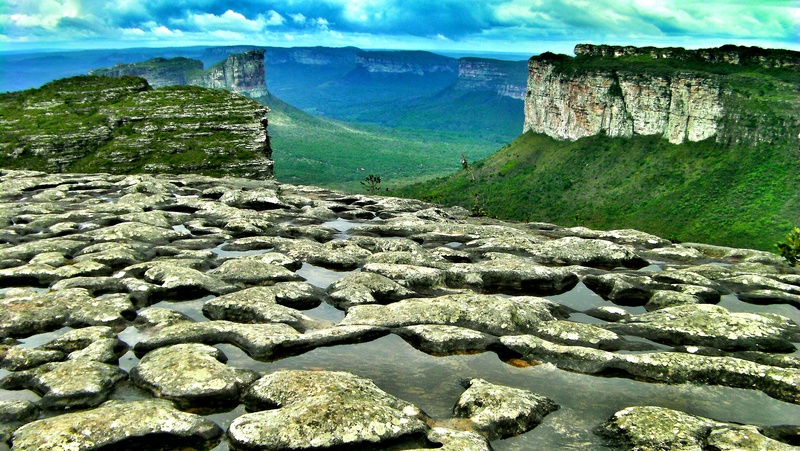 To reach the town of Lençóis, on the edge of Chapada Diamantina National Park, it’s a six hour bus ride west of Salvador. Several buses depart from Salvador daily but it’s advisable to take the early bus to arrive in Lençóis whilst it’s still daylight, and to appreciate the changing landscapes of the interior from your window seat. 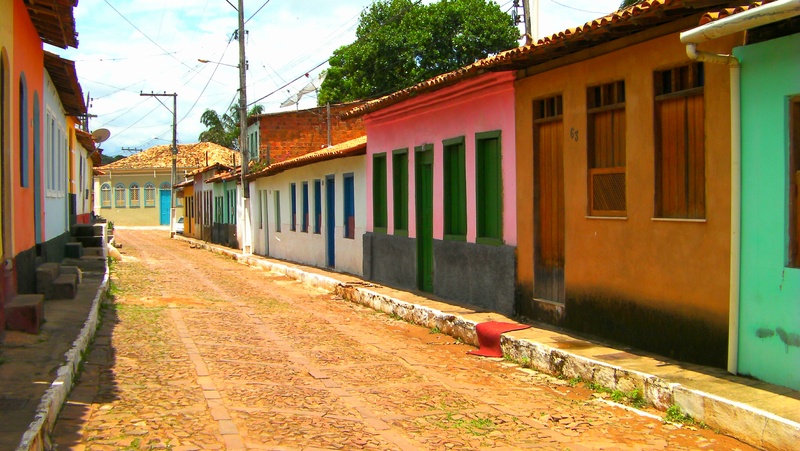 Once we’d escaped Salvador’s far reaching suburban sprawl, the road passed through the beautiful rolling hills of the recôncavo. This lush, green area is filled with forests and plantation farms harvesting sugar cane, cashew nuts and oranges. 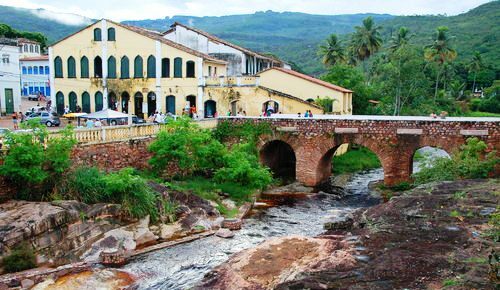 The greenery is punctuated by pretty colonial towns, some with protruding brick chimneys of old sugar mills left over from days when this was one of the most important sugar growing regions in the world. Around half way into the journey we entered the sertão, one of the driest and most inhospitable parts of Brazil. We passed scorched and barren fields and jolted across dusty, potholed roads. We overtook donkey’s pulling carts and cowboys on horseback making their way back to farms surrounded by fields of cacti. 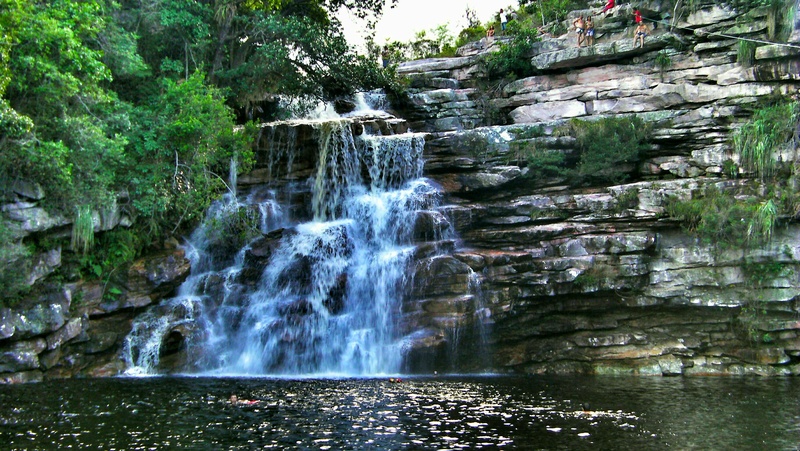 Chapada Diamantina National Park is ironically part of this region but like an oasis in the desert, this area is a verdant, semi-tropical paradise filled with rivers, waterfalls and swimming holes. Our bus pulled into Lençois mid-afternoon and it was love at first sight for this picture perfect small town full of charm and colonial character. Lençois is one of three preserved towns in the region to have been awarded National Heritage status and it’s easy to see why. From the bus station, a stone bridge with decorative arches crosses a bubbling river, drawing visitors into the town’s heart. Baroque churches and brightly painted houses with terracotta roofs surround the main square and spill out in all directions onto cobbled streets. The pace of life is relaxed and unhurried as locals watch the world go by beside ornate fountains. For us, the area’s beauty is enhanced by its small, friendly population and its undeveloped tourism but this wasn’t always the case. When diamonds were discovered in the 1840’s, the area blasted into life attracting prospectors and adventurers who dreamed of making their fortunes. The population swelled and tents sprung up across the landscape. Looking down from the hills the fabric of the tents looked like sheets blowing in the wind – which accounts for the name Lençóis, translated as ‘sheets’ in Portuguese. For a brief period, Chapada Diamantina was at the heart of the world’s diamond mining and precious gems from the surrounding mountains were shipped around the globe. However, by the early 20th Century superior quality diamonds had been found in South Africa so Chapada quickly lost its sparkle. Lençóis was abandoned and for nearly a decade it lay forgotten to the outside world until it was granted national park status in 1985 and became an eco-tourist destination. Nowadays, Lençóis is an ideal spot for travellers, with an excellent choice of guesthouses, cute bars, rustic restaurants, internet facilities and outdoor activity centres. The relaxed vibe attracts hippies and those seeking alternative lifestyles. The new wave of settlers came from across the world so despite its remoteness, there’s somewhat of an international feel to the town. 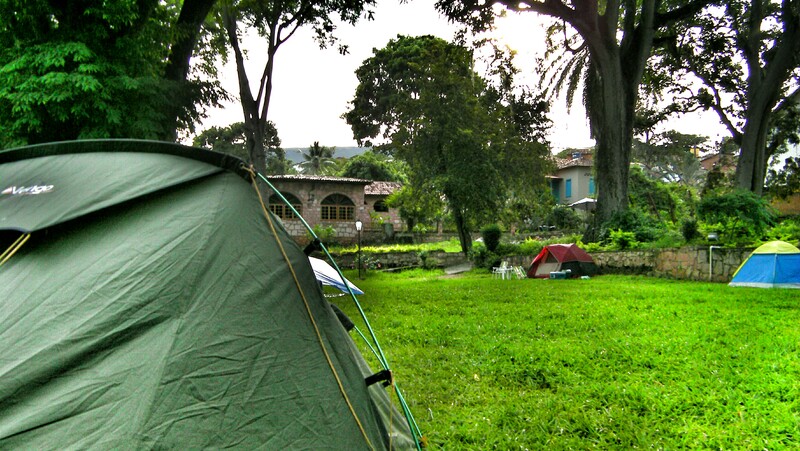 We’d carried our tent around South America for ten months by this point and as the air was much cooler in Lençois than the steamy coast we decided to camp in the spacious and lush gardens of Pousada & Camping Lumiar. The owners have beautifully renovated a historic hacienda with double rooms available and for the campsite they’ve created a fully equipped kitchen and BBQ area and decent toilet and shower facilities. The soft grass made for a comfy base to lay our tent and there were mature trees for shade. Breakfast was served in the summer house at the end of the gardens. Each morning we enjoyed steaming pots of fresh coffee, hot bread, herb cheese, chilli jam, eggs, sweet potato fritters and light pancakes with syrup and fresh tropical fruit. We’d hardly needed to eat for the rest of the day! To work off the huge breakfasts for which Lençóis is famous for, there are a multitude of activities and excursions on offer. The countryside around the town is nature’s playground and its biggest draw card. Choose from trekking, horse-riding, swimming, climbing, mountain biking and kayaking, or take an organised tour to local beauty spots such as waterfalls and spectacular caves. You could stay here for a week and only scratch the surface of things to do. 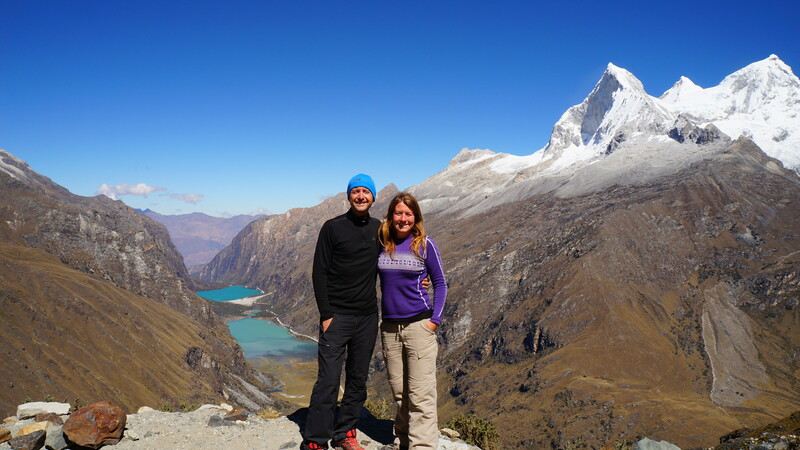 The trekking possibilities within the National Park are endless, with everything from half-day independent treks to multi-day expeditions with one of the many agencies. 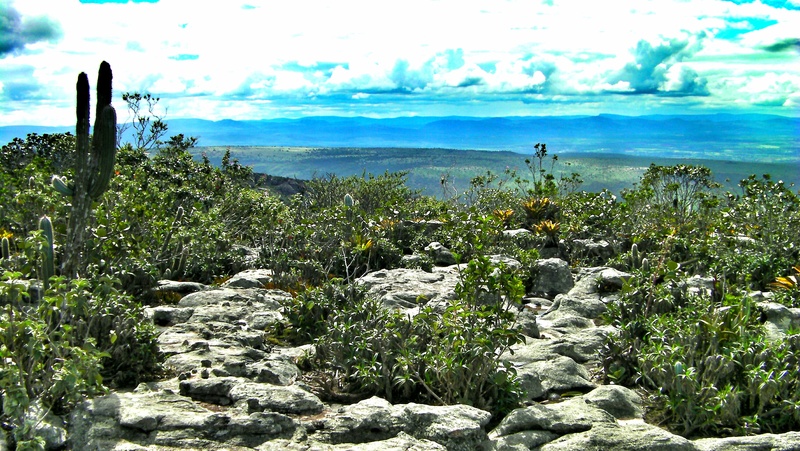 The landscapes of Chapada are spectacular. 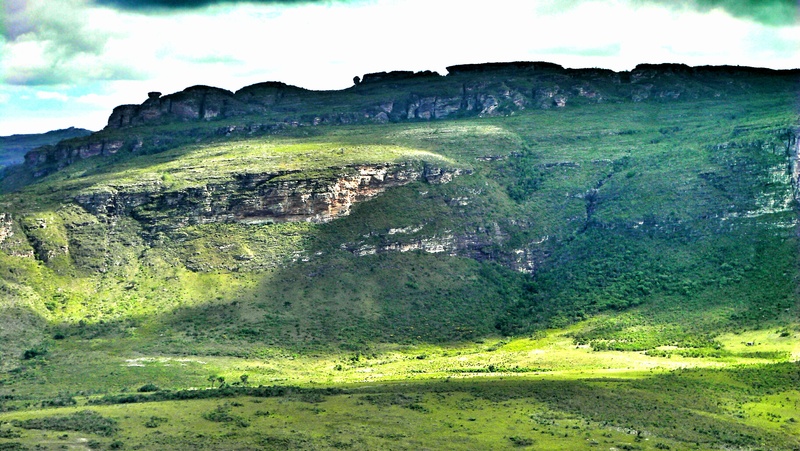 The table mountains were formed by the movement of tectonic plates millions of years ago and erosion from wind and rain has exposed rugged escarpments with layers of coloured rock and unusual shaped formations. Due to the park’s isolation, the wild-life and plant-life here has flourished. New species have evolved and live harmoniously alongside one another. Between scrubland bushes grow delicate pink orchids (of which the park has over one hundred species). Flowering cacti grow from gaps in the rocks. Graceful humming birds sip nectar from brightly coloured flowers whilst tiny lizards soak up the sun’s rays on smooth, round boulders. Macaws shriek loudly as they fly overhead and graceful butterflies float on light winds effortlessly and without a sound. 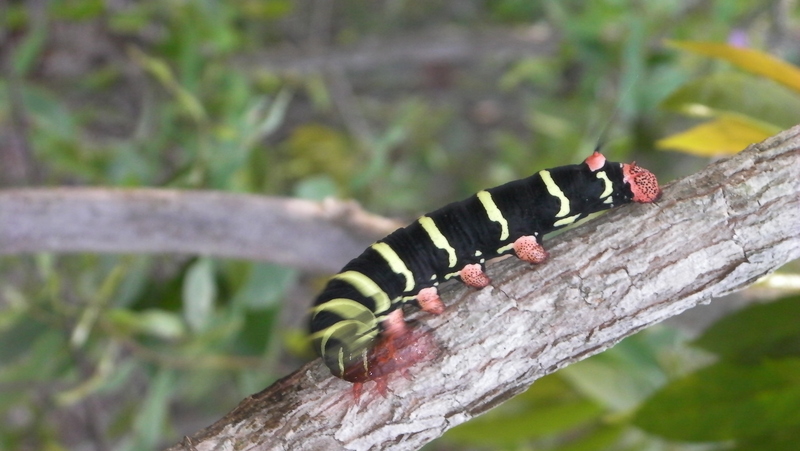 We didn’t get to see an Ocelot or a Jaguar, which apparently inhabit the Park, but the most unusual animals we did notice were multi-coloured caterpillars with raised lumps down their bodies and the power to flip tails violently back and forth for defence. As Dan put his hand innocently next to one of the caterpillars, simply to gain perspective on its size, the tail thrashing made him jump so much he nearly ended up in the bushes! 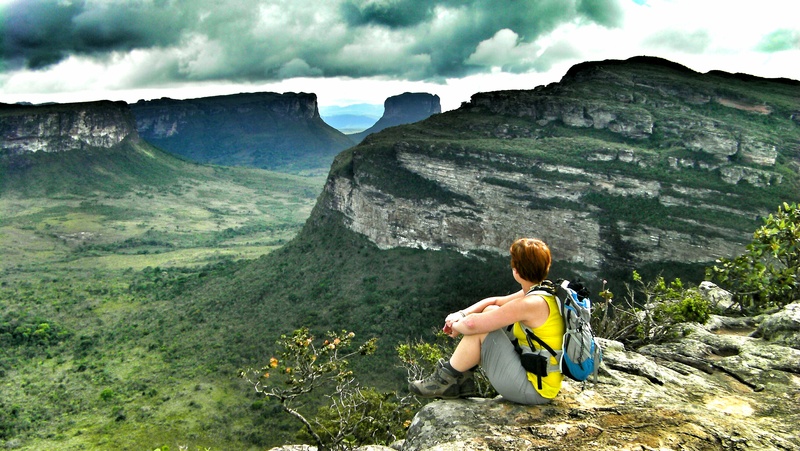 In our opinion, one of the best ways to take in the dramatic landscapes and get your bearings is to make a day trek to Morro do Pai Inácio. This rugged outcrop stands 1120 metres high and offers some incredible 360 degree panoramas of the National Park’s green vegetation and the surrounding mountain chains. No buildings are allowed within its boundaries, aside from the derelict miners’ houses, so the views are uninterrupted and guaranteed to stay that way. Under the earth’s surface, the park is equally dramatic and beautiful. There are miles of underground caves and rivers to be explored in the region. 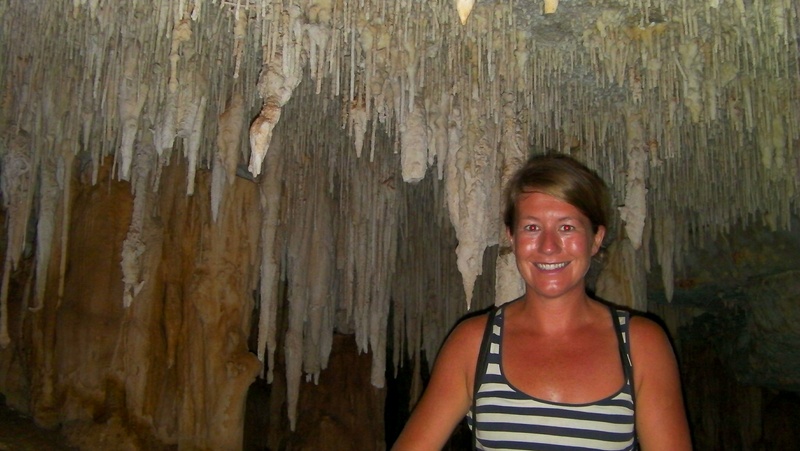 To access the caves it’s necessary to take an organised tour and visit with a guide. The caves are not fitted with lights so hard hats and torches are provided. Stick with your group and watch your step as the rocks can be slippery. One of the most photographed caves in the area is Gruta Azul (Blue Grotto) where small shafts of sunlight combine with magnesium in the water to make it appear vivid turquoise at certain times of day. 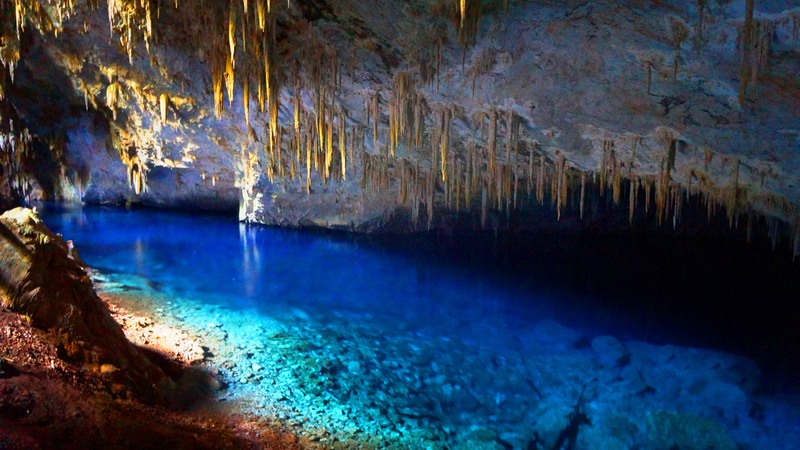 Gruta da Pratinha is another water filled cave and if you’re feeling active it’s possible to snorkel or canoe in the underground freshwater lake. We visted Gruta da Lapa Doce and marvelled at stalactites and stalagmites. The extensive underground network means you can hike for miles discovering vast chambers and tiny nooks. Bats swooped around in the rafters and their high pitched squeaks echoed through the cave. 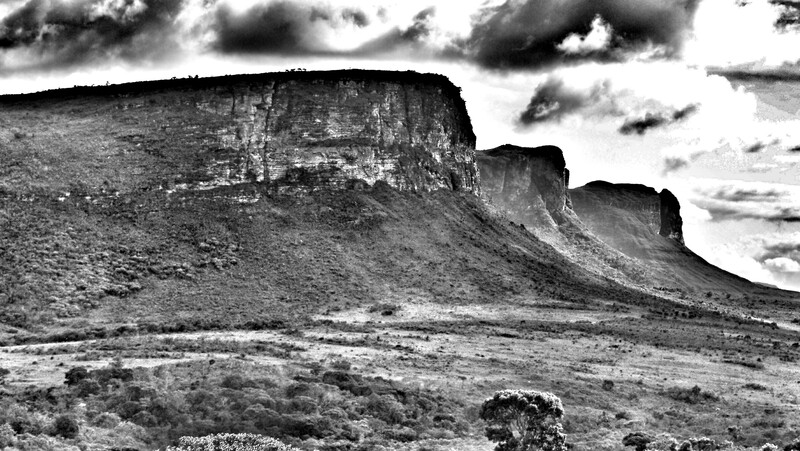 The whole area is awash with beautiful waterfalls and it’s even home to Brazil’s tallest. Cachoeira da Fumaça has a 420 metre drop, equivalent to a 112-story building. Persistent winds create swirling mist above the falls, and from a distance it looks like plumes of smoke. From Lençóis it’s a two day hike to reach the falls and there’s a steep climb to the top. The views for those daring enough to creep on their bellies to the edge and peer over are immense. 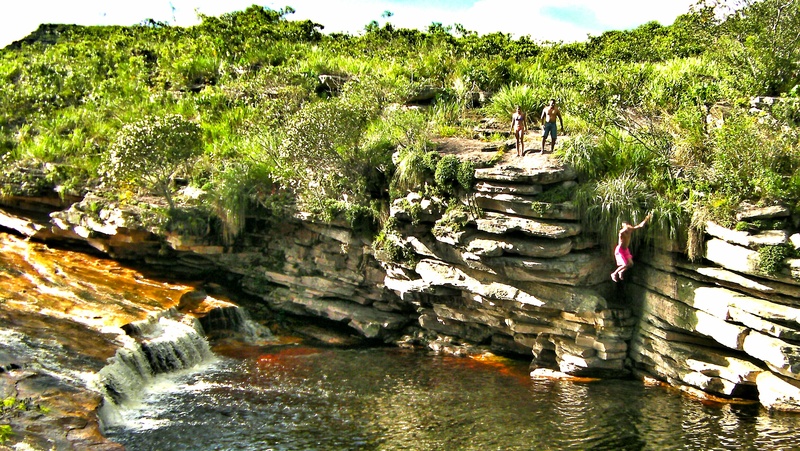 Cachoeira do Diabo can be reached independently on a day walk from Lençóis. We found it quite commercial with a café at the entrance and a zip line but it’s still a very beautiful spot. 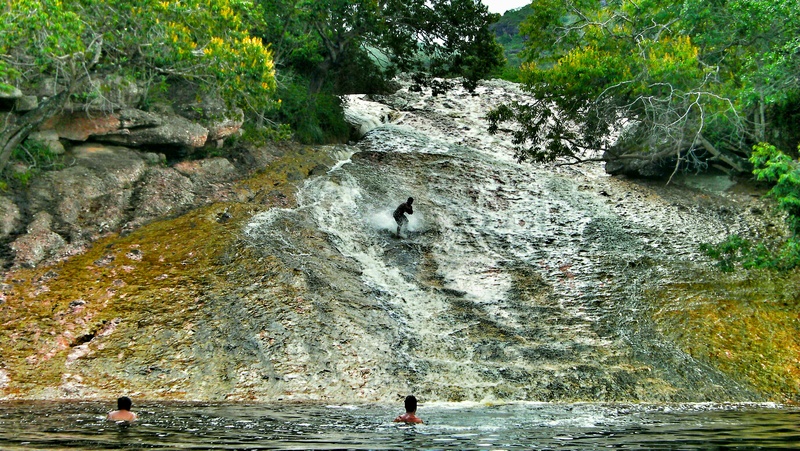 We swam behind the waterfall and climbed onto its numerous ledges to feel the full force of the water on our shoulders. 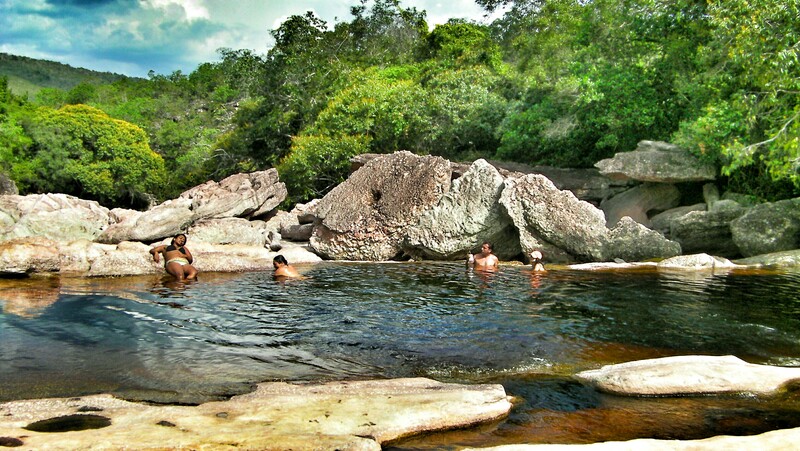 On our last afternoon in Lençóis we took an easy 30 minute walk through bush land to Ribeirão do Meio, a natural rock slide and swimming pool. We knew we must be getting closer when we heard whoops and splashes and arriving at the clearing we spotted daring young guys leaping from rocks layered like stacks of pancakes. Around the edge of the swimming hole groups of locals and tourists relaxed on large smooth boulders. Resourceful vendors had carried BBQ’s and cool boxes filled with beer and ice-cream with them – a great treat in the warm afternoon! As we dangled our feet in the water, shoals of tiny fish darted under submerged rocks and occasionally nibbled on our toes. The water slide captured everyone’s attention. 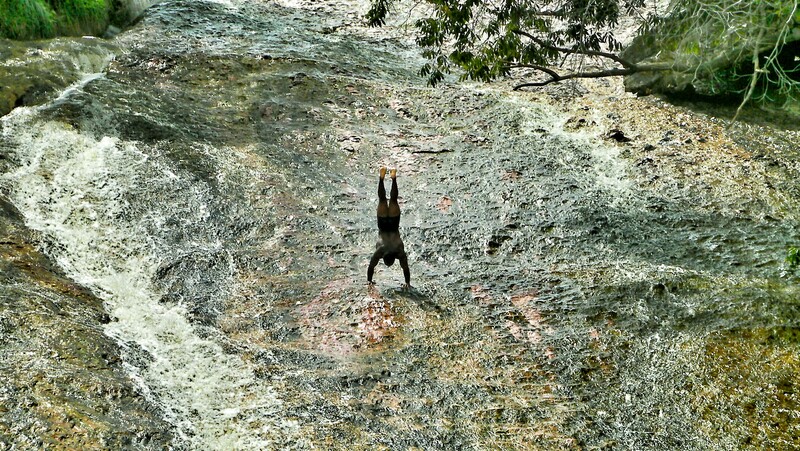 The top of the slide was accessed by clambering up dry rocks to one side and once in a seated position, the smooth, algae covered slide ensured people zoomed down at lightning speed and were deposited in the deep pool at its base. A muscular young Brazilian guy called Puma (we knew this as his friends chanted his name over and over to spur him on!) showed off his acrobatics surfing down the length of the slide on his feet and even performing handstands! Beautifully warm evening temperatures ensure that eating and drinking alfresco is an absolute pleasure. As darkness falls, tea lights are placed on wooden tables lined up along the cobbles. Several places serve classic Bahian dishes but more commonly Lençóis has a surprisingly international menu with everything from Mexican to Thai food. There are even some great little vegetarian restaurants, which in a meat loving Brazil is a pleasant surprise. Wherever you decide to eat, you’ll never be far from free-spirited musicians serenading you. It’s a great way to get people together and with a beer in hand we chatted about our adventures that day and the many still to come.